If you have a baby who wiggles all night and gets their blankets all tangled up, you need to enter this competiton. You could win a beautiful Slumbersac sleeping bag of your choice (you can choose the colour/design, size and tog). All Slumbersac children’s sleeping bags have been designed in the U.K by their own in-house design team. There is a wide range of beautiful embroideries, appliqués and prints available so you will have loads of choice. 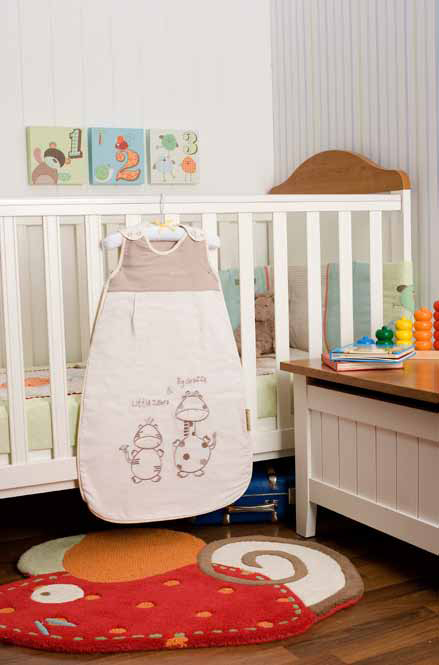 All their sleep sacks are rigorously tested to meet high quality and safety standards; they are each lined with 100% pure cotton for natural comfort. The filling is made from soft polyester fleece to prevent migration and allergies. 1. Closing date is 1st May 2013. 2. This offer is only open to UK residents. 3. Only one entry per person. 4. The winner will be chosen at random. 5. No cash alternative is available. 6. We reserve the right to amend these competition rules at any time without prior notice. 7. In the event of a dispute with regard to a competition or its outcome, the decision of What Mummy Thinks is final and no correspondence will be entered into. 8. Entrants must be over 18 years old. 9. All competition entries must be received by the closing date specified on the competition entry page. Any entries received after this date will be automatically disqualified. 10. All taxes, insurances, transfers, spending money and other expenses (including meals or personal expenses upgrades etc.) as the case may be, unless specifically stated, are the sole responsibility of the prize winner.